Inferential evidence from biogeography proves common descent. Biogeography is the study of the distribution of life forms over geographical areas. Biogeography not only provides significant inferential evidence for evolution and common descent, but it also provides what creationists like to deny is possible in evolution: testable predictions. Biogeography is split into two areas: ecological biogeography, which is concerned with current distribution patterns and historical biogeography, which is concerned with long-term and large-scale distributions. The patterns of biogeography are the result of the interaction between the two great engines of our planet: evolution and plate tectonics.... Because it faces such wide-ranging questions, biogeography must draw upon an extensive range of other disciplines. Explaining biodiversity, for example, involves the understanding of climate patterns over the face of the Earth, and the way in which the productivity of photosynthetic plants differs with climate and latitude. Biogeography, then, is concerned with the analysis and explanation of patterns of distribution, and with the understanding of changes in distribution that have taken place in the past and arc taking place today. Science proceeds by the ability to create predictions on the basis of a theory or suggested explanation; the degree to which the predictions are successful points to the strength of the theory or explanation. The prediction that is made possible by biogeography is this: if evolution was, in fact, the case, we should generally expect species that are closely related to be found near each other, unless there are good reasons for them not to be—such as great mobility (for example, sea animals, birds, and animals distributed by humans, or, over longer time frames, plate tectonics). If, however, we find that species were distributed in an effectively random geographic manner, with closely related species no more likely to be located close to each other than not, this would be strong evidence against evolution and common descent. If life forms arose independently, for example, it would make as much sense, if not more, for them to exist wherever an environment could support them, as opposed to being distributed according to their apparent relationship to other life forms. The truth is, as you might expect, that the biogeographic distribution of species supports evolution. Species are distributed around the globe largely in relation to their genetic relationships to one another, with some understood exceptions. 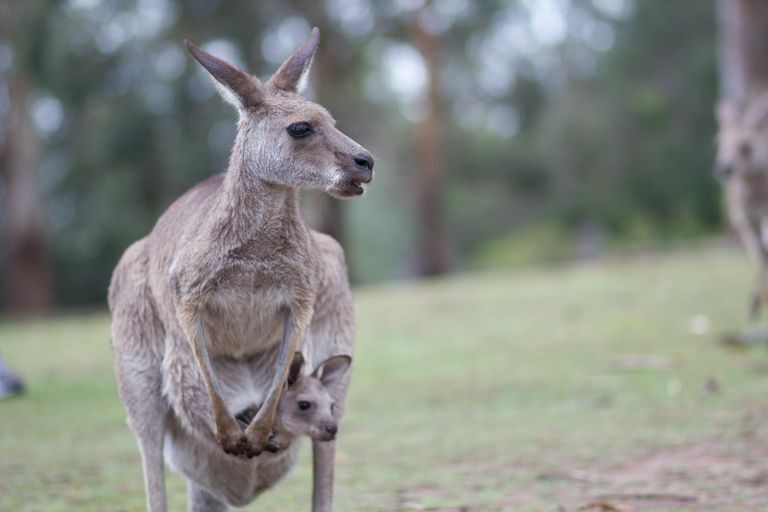 For example, marsupials are found almost exclusively in Australia—isolated from the rest of the continents for millions of years—whereas placental mammals (not counting those brought there by humans) are very rare in Australia. If marsupials were distributed evenly around the world, though, it would be difficult to explain that as the product of a natural evolutionary process. The few placental mammals native to Australia are murine rodents, bats, seals, and sea lions, dugong, whales and dolphins. Bats flew in about 50 million years ago, sea mammals can swim, and most of the murine rodents (mice and rats, and called "new endemics") arrived with human colonists between 50,000 years and 200 years ago. One group of mice and rats (called "old endemics") do appear in the Australian fossil record about 4 million years ago. Murines are among the most common mammal on our planet and are recognized as adept at oceanic dispersal (known as "rafting events"). Another way in which biogeography provides strong inferential evidence for evolution is in the consequences of introducing foreign species to an environment where they have never existed. As noted above, the special creation of each species or their independent arising should lead to a uniform distribution wherever the environment will support them, but the fact is that every species exists in only some of the environments where they might otherwise be able to survive. Sometimes humans have introduced those species to new environments, and very often this has had disastrous consequences. Evolution explains why: the local, native species have all evolved together and thus have evolved ways to deal with local threats or to take advantage of local resources. The sudden introduction of a new species for which no one has any defenses means that this new species can run rampant with little or no competition. New predators can destroy local animal populations; new herbivores can destroy local plant populations; new plants can monopolize water, sun, or soil resources to the point of choking out local plant life. As noted, this makes sense in the context of evolution where species have all evolved under the pressures of local conditions, but there would be no reason for this to occur if all species were specially created and thus equally suited to live with any other group of species in any random but suitable environment. Beck, Robin M. D. "The Biogeographical History of Non-Marine Mammaliaforms in the Sahul Region." Handbook of Australasian Biogeography. Ed. Ebach, Malte C. Boca Raton, Florida: CRC Press, 2017. Print. Cox, C. Barry, Peter D. Moore, and Richard Ladke, eds. Biogeography: An Ecological and Evolutionary Approach. 9th ed. Oxford, England: John Wiley & Sons, 2016. Print. Rowe, Kevin C., et al. "Pliocene Colonization and Adaptive Radiations in Australia and New Guinea (Sahul): Multilocus Systematics of the Old Endemic Rodents (Muroidea: Murinae)." Molecular Phylogenetics and Evolution 47.1 (2008): 84-101. Print. How Have Holy Places in Islam Connected to Religious Violence?